Agilent Technologies has expanded its digital storage oscilloscope and digitizer portfolio with three new low-profile models in the Infiniium 90008 Series. These hybrid instruments offer the highest channel density available in ultrahigh-performance oscilloscope/digitizers, with eight channels that deliver digitizing rates of 40 GSa/s and bandwidths from 8 to 13 GHz - all in a 7U-high package. Engineers and scientists working in high-energy physics or radar rely on the ultrahigh-speed digitizing capability of high-performance oscilloscopes to make accurate measurements on single shot phenomena. Using multiple oscilloscopes to reach desired channel counts can be problematic in space-constrained test environments. Agilent's Infiniium 90008 Series low-profile, high-performance oscilloscopes/digitizers have twice the channel density of traditional oscilloscopes, providing unmatched space efficiency. Researchers can use the instruments individually or combine multiple units to deploy systems with hundreds of channels of measurement capability. "Agilent has been the fastest-growing scope vendor since 1997," said Jay Alexander, vice president and general manager of Agilent's oscilloscopes business. "We focus our engineering efforts on delivering the measurement capability our customers need. The Infiniium 90008 Series has the performance and channel density to support leading-edge research so critical to basic science and modern physics." The Agilent Infiniium 90008 Series low-profile oscilloscope/digitizers include have a number of impressive features, such as, real-time measurement accuracy. Leveraging technology from the award-winning Infiniium 90000 Series high-performance oscilloscopes, these new oscilloscope/digitizers a very low noise floor of 40 GSa/s. 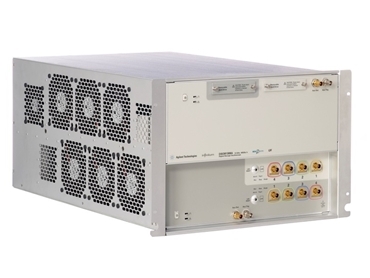 And a final impressive feature of the Agilent Infiniium 90008 Series low-profile oscilloscope/digitizers is their fast offload speeds and compatibility with industry-standard computation packages. Users may offload data for custom analysis on their PCs using an optional high-speed PCIe(r) bus card to transfer data at sustained rates up to 150 MB/s. Device drivers for VxWorks, LabVIEW and Linux, with application code examples for MATLAB(r), C/C++, Visual Basic, LabVIEW, and LabWindows/CVI software are standard.